We love learning about our customers and their libraries, and we believe you will too. The Children's Shelter of Cebu has provided homes for orphaned, abandoned, and surrendered children in the Philippines since 1979. Contest submission written by Shari Reasoner, Librarian. It’s library day and Eugene wants to check out the next book in the Ranger’s Apprentice series. He looks at the spine label and heads to the part of the Fiction section. Juliet wants to check out a Clifford book. She read one in her class and is excited there are more books about Clifford. I help her look in the Easy section and we hunt for the spine labels that have Bri Mary. Grace is ready to tackle chapter books and wants to know where to look for ones for girls. I point her in the direction of the Fiction section of books with spine labels that read Ame for American Girl books. Maybe she’d like to try a Junie B. Jones book too. The Level B reading class is studying about camouflage. A bunch of the kids ask where to find books about animals that use camouflage. We brainstorm about how to do that and someone remembers that we should search on the ResourceMate computer using the keyword camouflage. The Reading Challenge contest is in full swing. Kids race into the library each day to return their books and check out a new stack to read at home. Teacher Amanda comes into the library looking for books on the theme of risks and consequences. She searches and finds a number of books she can check out and keep in the classroom for the kids to read while they are working on this topic. Teacher Alfie stops in right before leaving for the day to check out some books to read to his girls at home. Sounds like a pretty normal day in the life of a library. The children are thrilled to learn what a library is. No one has to convince them how cool it is to browse the shelves of books and check out books to take home to the shelter. Teachers have also often never been inside a proper library. To have an automated system and thousands of books at their fingertips is pretty unbelievable. 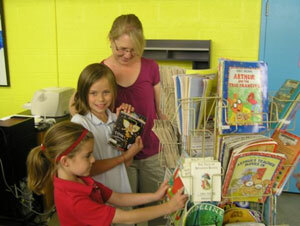 The children and teachers are taught how to look for books in the library. They learn what spine labels and bar codes are and how the books are organized on the shelves. They are taught how to search for books by title, author, subject, or keyword. 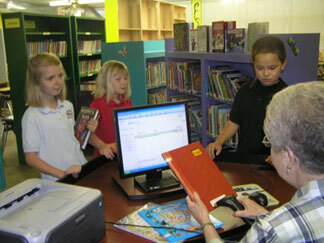 The children hover around the ResourceMate computer in the library eager to have their books scanned so they can start reading their selections. John Knox Christian School was established in 1959, with a staff of three teachers and an enrollment of 120 students. Today, it has staff of 24 full and part-time teachers and assistants serving a student enrollment of just over 200 from Junior Kindergarten to Grade 8. Contest submission written by Margaret Grift, Librarian. ResourceMate® has enabled our library to reflect what is happening in 21st century education, particularly with regards to providing equitable access to information. The Ontario School Library Association’s Together for Learning document detailing the importance of the school library’s shift to a Learning Commons model emphasizes the importance of equitable access of information and the use of technology to that end. An “online presence” is part of this vision; ResourceMate’s Web OPAC is part of our library’s online presence. A few years ago we implemented ResourceMate’s Web OPAC. It enables students and teachers to search the library collection 24/7 from any device with Internet access. Previously, patrons had to ask the librarian for help to find items in the collection. Item information was available on the librarian’s computer only. Now anyone in our school’s community is able to search the collection by author, title, subject or keyword. Access to the library’s catalogue is through a link on our library’s web page which is on our school’s web site. Using Web OPAC has had several positive results. First, by learning how to use our online catalogue, students know how to search any online catalogue in any library which is an important research skill. Second, having patrons being able to search on their own frees up library staff to do other things. Third, teachers are able to save time by searching the library catalogue from where they are rather than by having to come to the library. Fourth, we have started cataloguing web sites in addition to books, so it allows us to provide guided access to appropriate web sites for students. ResourceMate® has helped our library to be a current, important resource for the school by supporting its strong reading program and equipping students to be lifelong learners. Contest submission written by Brenda Buchanan, Librarian. 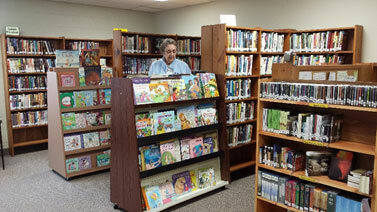 The Jennie Woodworth Library in White Bluff, TN is an all-volunteer staffed, donation funded library. It was started in the spring of 2009 by a group of citizens who recognized the benefits that a library would bring to a community. This group of citizens had no previous library experience. With limited knowledge and only donations to fund them, ResourceMate fit their needs and their budget. Little did they know exactly how much they had received with that purchase. In 2012 I started volunteering with this wonderful group. I have worked in libraries for many years and had worked with other automated library systems. I was simply amazed at how much this system offered, but my biggest amazement was the support this company gives. Never has there been a time that we have felt embarrassed to ask anything of this company. No question is too small or problem too little to receive nothing but the BEST service. As I mentioned before, we are an all-volunteer staffed library and our volunteers range in age from the mid 20’s to the late 80’s and every volunteer knows how to use this program. It’s just that easy. This allows us to give top-notch service to each and every patron, which in turn helps our community by providing access to information and materials that will help better their lives. We all know how quickly a business/organization can fail because of lack of participation by a community and, with its ease of use; ResourceMate is designed to help alleviate that concern. Our patrons are always telling us how impressed they are with our library and ResourceMate is one of the biggest reasons for that. In 2015 we moved into a new state of the art, multipurpose building and with ResourceMate we fit right in. Our community is growing, businesses are coming and The Jennie Woodworth Library is helping to attract them. RICE is a new international school that started in September 2014, in Addis Ababa Ethiopia. They use the Cambridge curriculum, International Primary curriculum and Ethiopian National curriculum. At Reach International Center of Education, or RICE, we are still a young school, being in our second year. We primarily serve the Ethiopian community and are based in Addis Ababa, Ethiopia. We currently have 77 children spread across 5 grade levels from upper KG to Grade 4. As someone who loves reading and who had considerable access to books growing up, quite a contrast is found when considering the situation across most parts of Ethiopia including the capital city, Addis Ababa. Public libraries are hard to find and where they do exist, books are often not allowed to be taken home, because of the lack of tracking such items. Thankfully, bookshops are springing up all over the city, but the variety of books is often limited and expensive. Consequently, you still do not find many books in Ethiopian homes. The culture of reading is still developing. An important aspect in developing the vision for RICE was to encourage and develop a strong reading culture within the school. Thus the need to both develop a library of appropriate children books, but also provide the means to track the circulation of books so that they don’t remain collecting dust on the shelves, but rather may be taken home on a weekly basis. ResourceMate® provided an affordable and yet comprehensive software that has enabled us to develop our library with confidence. With only 3,500 titles so far, we remain a small library, but it’s growing each year. As we see the school expand, adding a grade level each year, we anticipate the library will continue to be a central part of the educational process provided by the school. ResourceMate® is helping us catalogue this growing resource. We are not yet at the stage where children can search for specific books, but that time will come and I am confident that ResourceMate® will continue to provide the sophistication and capabilities necessary to handle a comprehensive educational library. We don’t have a librarian. I may be the Director, but my responsibilities are many, including running and maintaining the library. I found the software easy to use. In fact I now have two children assisting me in handling the circulation of books in their class. That’s how easy it is to use! Reaching our 10,000th registered user has made us reflect on our very first registered user, Bea Lithgow from Ontario, Canada. In 1992, Bea started to research library automation software programs for her church, Peterborough Free Methodist Church and heard about ResourceMate® from the Church Library Association of Ontario, an association that she is still a member of today. ResourceMate® was still in a very early development stage, and the developer greatly appreciated her input and librarian expertise. Since that time, Bea has moved cities and libraries and has brought ResourceMate® with her all along the way. She started with our original version of 2.0 and has upgraded along with us and is currently using ResourceMate® Essential Plus at Huron Park Baptist Church in Woodstock, ON. The church library has approximately 4,000 items, including DVDs, books, CDs, and study kits that include several different types of resources. Bea started working in libraries in 1970, when her daughter volunteered her to help with the school library. “I committed to work in the library for a year, and started my librarian training. My family moved the next year, and there happened to be an opening at the public library at the children’s department. I applied for the job and got it. I loved the work and found it very interesting, and I still enjoy it to this day. When we started at Huron Park Baptist Church the library volunteer team was already set up. Today, we have 9 volunteers that includes a 9yr old and a teenager. I’m a firm believer in organizing the library as if it were a public library, with dewey decimal classification and organization. Even if you start small, the easier it will be to control as it grows larger, so you might as well start with being organized. The pastors love the library, they bring their books to be catalogued and to be kept organized. We know where the items are now, if it is checked out, on the shelves, etc. If you want to find things, you know where they are. And then, because of that, people come in to the library more. One of my favorite features of the program is the patron search (OPAC) screen. It’s the best thing since sliced bread! It’s so easy to use and find items. I love searching by keyword. It works the same as the public library, your developers have done a great job! Something I highly recommend to everyone is to create regular backup files of your data. I have the volunteers back up every week, and I also go in once a week to create my own backup on my flash drive. We really appreciate Bea Lithgow and the way she has supported and promoted ResourceMate® for over 20 years! Working in a highly specialized private library, Craig Music Library, my interpretation of "patron" and "community" may not be the same as those of libraries where patrons walk into the actual library and certainly "community" wouldn't mean just the surrounding geographical area. My patrons are mostly scholars and researchers, many of whom are at major universities throughout the country and world. By finally getting all the holdings online, a significant resource has been opened to these people--my patrons--and to the general public as well. The collection consists of rare, hard-to-find materials in many formats--print and digital. Materials are loaned to libraries who ensure the materials well-being and safe return. Materials for individuals are available through a copy service at a fee. With over 3,500 vocal scores, 4,500 recordings of operas and choral music, 1,500+ video and DVD recordings, and nearly 5,000 individual sheet music holdings, the collection rivals even the largest research libraries. I have received numerous e-mails and notes from serious scholars thanking me for making this collection available. I feel that this library, small though it may be, fulfills a need that few others meet. The goal of the Mid-Prairie Home School Assistance Program is to provide support, resources, and assistance to parents as primary teachers in their endeavor to achieve quality home education. Some of us have been around the home school program long enough to remember when we didn’t have ResourceMate® in our library. Those were the days of paper book cards and dated rubber stamps. Managing materials really depended on the knowledge of our head librarian and her familiarity with the resources she ordered. Finding books meant going to the shelves to see if we “had it” and hoping that a title wasn’t misplaced or lost. Our card catalog system was cumbersome, not user friendly, and we were ready for a change. Through the years, our home school group has grown from a small co-op of families to over 300 students for which we provide and manage resources. Without ResourceMate® our efficiency and patron visibility would be greatly reduced. The program allows our staff opportunities to catalog and categorize our materials specific to our needs. The keyword searches and instant access to resources increases our productivity, allowing the staff to spend more time with patrons and personalizing the library experience. We appear professional and organized to the community. This year, ResourceMate® helped us go online with our library. While we have always been happy ResourceMate® users, this has been a game changer. The attentive staff walked us through every step of the transition. They were available to answer any questions we had and we had A LOT of questions! I’m not sure how to quantify how much this feature has changed our librarians’ day. Patrons can now check to see if we carry a book or educational tool online instead of calling or emailing the library t verify we have a resource. This in turn helps with the ordering process as we try to fulfill requests from families to keep our library current. Which in turn offers more time to work with parents and students culturing a love of reading and learning from beyond our library walls. The website looks professional and is easy to use. Our home school community users can feel secure since it is password protected. The patrons of our library love the ability to browse from the comfort of their own homes that also serve as their children’s schoolrooms. They can request the next needed Math book or fiction title during free time, nap times, or even after hours when accessing the librarians has never been an option. Overall I think the biggest change since we implemented the ResourceMate® system in our library is the preservation of our time and ability to access our patrons’ needs more efficiently. We all have tools that we depend on to make our workdays more effective. To our library, ResourceMate® is a tool we couldn’t be without. Thank you for your highest standards in quality and customer care. The library serves approximately 1000 people and includes staff, physicians, nurses, patients, the community, and students. The library collection started in the 1990’s when physicians and project directors decided to put all of their written works in one centralized location. They have a wide collection of medical information, data and statistics, and written reports from various local physicians. Having this type of information in a special library helps the community to be more aware of harmful diseases and teach them how to live a healthier life. The librarian, Sunshine Garcia, has worked in the medical field for almost 11 years. “After graduating college, I started working as a library technician for our local community college library. In 2009 I received my AS degree in library and information services and decided to broaden and try out something new. That is when I started to work for our Ministry of Health as its medical librarian. Now I assist our ministry with medical information, further medical education for our staff, and a whole lot of other work. So far it’s been a fun experience and I’m glad I’m here to be able to help others see the importance of living a healthier life. One of our goals is to create a digital library as a lot of the materials are in an electronic format. I chose this because I deal with people in the medical profession, and they don’t have time to sit down with a book as they always have patients to tend to. Electronic materials will allow them to easily browse on their iphones or ipads. ResourceMate® is helpful to my type of library as it is small and there are not so much materials. The program is inexpensive and it's easy to use. It didn't take me that long to learn how to use it. The basic step-by-step instructions make it easy for me to use as well as teach other people how to use it. It has helped me organize the shelves by subject matter therefore, making it easier to locate books. It's helped keep track of all books coming in or going out which is great because as a medical library I have various patrons coming in. Having the online catalog for patrons makes my job and my patrons job easier, no more going thru shelf by shelf in search of books. I love the function where I can print out the cards and call numbers directly from the software. It's less time consuming and less frustrations. Christ Community Lutheran School in St. Louis MO have used ResourceMate® since the fall of 2010. The school has 200 students in grades K-4, plus 40 students in preschool whose teachers use the library to check out classroom collections. The library is open 5 days a week, during school hours. Staff includes 1 part time librarian, Ruth Senske, plus 20 volunteer moms who check books in and out and also shelve them. They also do other library related tasks as needed. The library was established using school budget money when the school was opened in 1952. A card catalog system was used until 2003 until the library was automated using a software program with headquarters in St. Louis. In 2010, the collection was converted to ResourceMate®. All the students K-4, plus teachers, and many of the parents of the students and other members of the community use the library. They have a collection of almost 7000 books plus periodicals and videos. The library provides excellent books that are accessible to all of the students, parents and teachers. The love of reading is instilled in them. Research skills are taught. Supplemental materials for specific units teachers are teaching in the classroom are available in the library. “In the summer of 2003, two of our very active room mothers phoned me to say that they wanted to work on the library and would I help them. They would do the decorating, etc. if I would do the “librarian’s work”. Of course I said YES as it was so needed. They knew I had been a librarian before I retired. So that’s when I automated the library! 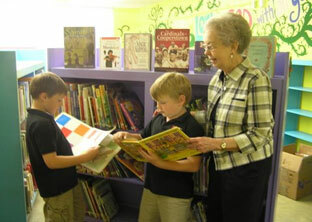 I had been the director of elementary libraries in the Lindbergh School District prior to my retirement. I had been responsible for automating their libraries. I have a passion for good libraries for children. 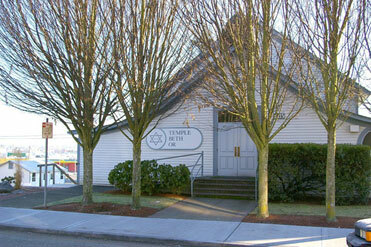 Temple Beth Or is located in Everett, WA and has approximately 130 families in the congregation. The library has about 2,500 volumes and includes all kinds of Jewish books and resources including DVDs, CDs, manuscripts, and sheet music. They heard about ResourceMate® from another synagogue in California who uses the same type of cataloguing and classification system. Carolyn Henri has recently stepped into a leadership position in the library committee, and is committed to getting the library up and running. “Our library has always been active, and it includes a children’s library and a main library. We were using a card system where people would write their names on their circulation cards, and so on. Our long term vision is to set up barcodes for checking items in and out, and having a circulation desk. We have a pretty active website for our congregation, and would like our membership to be able to see what is in the library and if it is available. We have 8 volunteers that provide our library team with extensive Jewish knowledge and varying interests in books. Their goal is to have the library up and running by January 2015, and we wish them luck in their endeavor! It is such a pleasure to visit with some of our customers and to see how they have established their libraries. It’s always a great experience to go beyond email and phone communication and to actually meet the people we’ve been talking with for years. During a trip to Virginia in 2010, we were able to spend some time at the James L. Jessup Memorial Library of Westminster-Canterbury of the Blue Ridge. 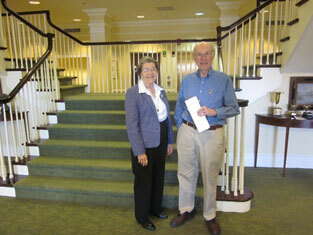 We were given a tour of the beautiful facilities by two of their fantastic volunteers, Robert Knospe and Joy Perry. This library is one that had a great impact on us, and we wanted to share their experience. 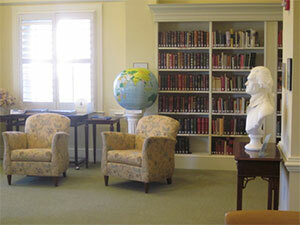 The mission of the library is to assemble, organize, preserve, and make accessible print and non-print material that reflect the interests and needs of WCBR residents and to provide a comfortable and inviting area where residents can sit and read publications, search for information and browse through the library’s book collection. “We're located in Charlottesville, Virginia. 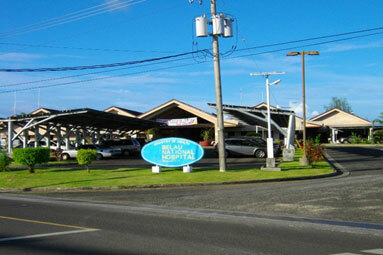 Our Library's web site is www.wcbrlibrary.org. We've been a ResourceMate® user for five years now. We don't have a librarian - only a Library Committee. 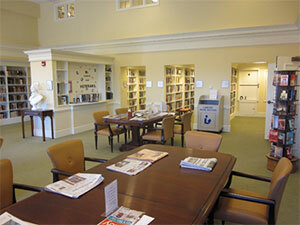 We have 400 residents in our community and about 10,000 items in our Library. The Library is open 24/7/365. We have 40 volunteers and no paid staff or librarian. Some of our volunteers have had library experience. The Library was started 20 years ago when Westminster-Canterbury was first opened here in Charlottesville. At the beginning we only had several hundred books, all donations from the new residents who entered our facility at that time. Our library is a central gathering place for residents who browse, read newspapers, magazines and books, chat and use it as a meeting place. It's also a site for our "Book Week" events in March. This year we're featuring talks by four of our residents who have recently written and published books. Our Library is also on the tour offered by our Marketing staff for prospective residents. Our Marketing staff reports it's one of the two "WOW" locations in our facility, the other being our Dining Room. 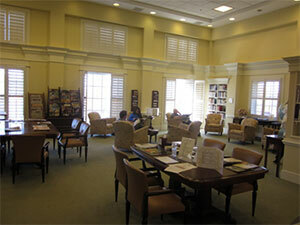 Residents also show off and meet in the Library when they have visiting family or friends. Our goal is to have the library organized in a way so that someone who has never been in our library can immediately find the book or section in which she or he is interested in. We're considering other cataloging systems other than our "home grown" system which is no longer adequate - we've especially interested in the one Maricopa County in Arizona is using for their libraries which is patterned after the way Barnes and Nobel organizes their books. In February 2015, we exhibited ResourceMate® at the American Correctional Association Winter Conference in Long Beach, California and it gave us an opportunity to visit some of our customers located in the area. One of the customers we visited is the Museum of Latin American Art, and Dr. Maria Mar graciously agreed to spend some time with us and show us around her library. The Museum of Latin American Art was founded in 1996 in Long Beach, California and serves the greater Los Angeles area. It is the only museum in the United States dedicated to modern and contemporary Latin American art. The Museum of Latin American Art expands knowledge and appreciation of modern and contemporary Latin American art through its Collection, ground-breaking Exhibitions, stimulating Educational Programs, and engaging Cultural Events. Q. How did you come to be involved with the library and did you have any prior library experience? A. My background is in Literacy, and I come from a career in Education. I have no prior library experience. I met a docent at a yoga class, and she invited me to join the docent program. During a tour of the museum, I noticed the disorganization of the library, and offered to help as the docent program would not begin for several months. Q. How is ResourceMate® helping you meet your goals for the library? A. ResourceMate® is making it possible to meet my primary goal at the MOLAA library, which is to bring organization, functionality, and accessibility to the library. Q. When and how did your library get started? A. Books were being collected through donations and the founder’s collection as early as 1996. The library space was completed in 2007 with the idea of having an additional resource for staff and the community. Q. Who will use your library, and how will it impact your community? A. In addition to curatorial resource by our staff, we are envisioning a valuable cultural resource for our community. We anticipate it will be used by students, researchers, and the public at large. We had 98,000 visitors to the Museum last year, and we have 46 staff and over 60 volunteers. We expect that the library will become the primary source for books on Latin American art in the region. Q. What factors made you decide to purchase ResourceMate®, and what are some of your favorite features of the program? A. I researched several software programs when I undertook the task of bringing organization to the library. I decided on ResourceMate® and made the recommendation for its purchase, based on the cost of the program and the apparent “friendliness” and “usability” for a novice. I like the program very much, but by far my favorite feature is the ability to import information at the touch of a button (ISBN retrieval feature). 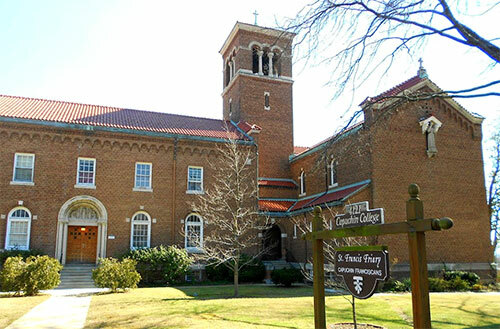 In April 2015, we exhibited ResourceMate® at the National Head Start Association Conference in Washington, DC and had the opportunity to visit Capuchin College. We were delighted to visit with the librarian, Sonia Bernardo and to have a tour of the college. Q: How did you come to be involved with the library, did you have any prior library experience? A: I obtained my MLS degree at the University of Maryland and was a librarian at the Holy Name College for 16 years before coming to Capuchin College. Being at this library is like a toy store for me, all of the books are very interesting. Q: Tell us about your library. A: This library is for those who want to go on to the priesthood. We have approximately 15,000 books that include subjects such as: theology, philosophy, and spirituality. We have special collections that include really old documents and history books of the Franciscan order. For example, we have books from the 1500s that are written in Latin and German. The library’s primary patrons are the friars who are attending the college, however other people can make special arrangements to come in to the library. We have the only copies of some of our resources. In fact, when we get requests from outside of the college for a book, we will make a copy of the required chapter(s) and mail it instead of having the book leave the library. We have approximately 30 friars presently at the college. Typically we’ll have around 25 and they come from all over the world to study here. Two of the friars are helping me with the library. Q: When and how did the library get started? 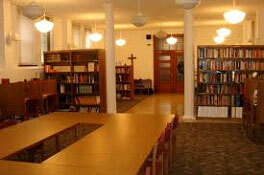 A: The building was built in the 1930s, and every capuchin college is required to have a library. I think that every friary should have a library no matter how small it is. A large percentage of the library collection has been donated over the years. When friars leave the college, they donate their books as they can’t take any possessions with them. They leave their personal and study books with the library, and their donations are always welcome. I’m very proud of our library and collection. We’ve had some well-known authors come to visit our library, including a priest from Rome who visits every summer as a guest speaker. He’s an advisor at the Vatican and he usually comes in to the library and uses our resources while he’s here. Q: What are your goals for your library, and how does ResourceMate® help meet your goals? A: We have a few goals that we want to achieve. We want to share our resources with other Franciscan libraries in the world. I’ve been sent to Rome twice to attend librarian workshops. Every capuchin college has a website that we can use to catalog, and we can look at the websites and find what they have. Another goal is to have a collection that meets the needs of the seminarians. If it’s not available in the university they are attending, then we should have it in the college’s collection. Also, it’s always my goal to weed out some of our books. For example, I have a guideline that if no one has checked it out since 1970 then it should be withdrawn. I’ll also pull multiple copies and store them in the basement to make room in the library for new items. I like using ResourceMate® because it’s not a complicated database and it is very accommodating. We are very satisfied with the program. It is convenient, very easy to use, and the pricing is very reasonable. Q: What factors made you decide to purchase ResourceMate®? A: Pricing was a large factor, and user friendliness. As a matter of fact, it was one of the friars who showed me the program and suggested that I take a look at it. I liked ResourceMate better than any of the other options presented. Q: What are some of your favorite features of ResourceMate®? A: I like the ISBN retrieval, printing labels, I love printing cards. When I first came to the library, we had to send out to have the catalog cards printed. Now I can do it myself in the library. Since it is automated, it’s easier to find items, and to search for what we need. And your customer support representatives are so helpful and patient.